Should Pluto be named after the sinister tentacle-faced monster Cthulhu from the novels of horror writer H.P. Lovecraft? 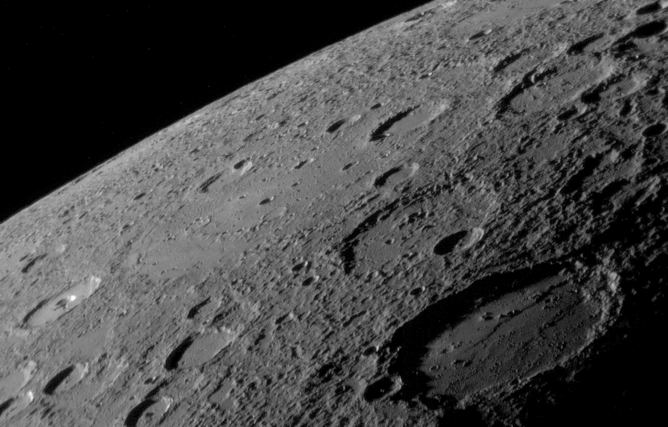 Or a crater on Mercury after iconic opera singer Dame Nellie Melba? Mercury and Pluto are at the opposite ends of the solar system, but this year, as a result of two extraordinary space missions, some of their newly observed topographical features will receive names. Four years ago, NASA’s Messenger spacecraft slipped into orbit around Mercury, the planet closest to the sun. It’s still there, but only just –- operating on a whisper of fuel, it’s predicted to fall to the surface on April 30. 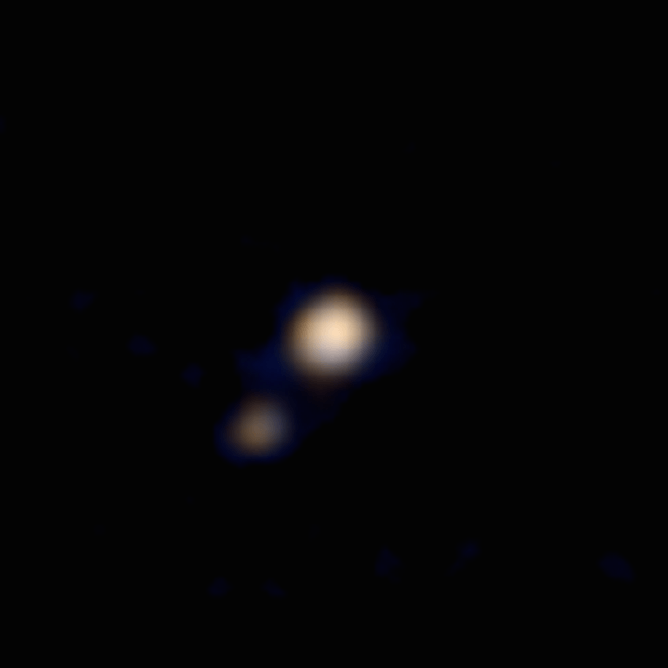 Around five billion kilometres away, the New Horizons spacecraft is in its final approach to Pluto. In July 2015, we’ll be able to see the surface of this controversial dwarf planet, discovered in 1930 by Clyde Tombaugh. For both planets, crowd-sourcing is being used to choose the new place-names. How do places in the solar system get named? We already use the names of gods and goddesses given by the Romans, over 2,000 years ago, to the most visible planets: Mercury, Venus, Mars, Jupiter and Saturn. The existence of Pluto, Uranus and Neptune wasn’t known until much later; but they were similarly named after classical deities. Planetary geography really kicked off with the invention of telescopes in the 17th century. Celestial places were being mapped by European astronomers at the same time as places on the Earth, in the era of European colonial expansion. The lunar maria (“seas”), mountains and craters familiar to us today were mapped by the first real selenographer (charter of the moon), the Dutch astronomer Michael van Langren, in 1645. (Incidentally, he also made the first known statistical graph). His place names were mostly European royalty and notable scientists of the time. These included French queen Anne of Austria, now more famous as a character in The Three Musketeers, and the Jesuit mathematician Jean Leurechon, who, among other achievements, wrote the earliest known description of how the ear trumpet works. Twenty years later in 1665, Giovanni Cassini observed Jupiter’s giant red storm. He called it the rather prosaic “Permanent Spot”, to distinguish it from the shadows cast by the orbiting moons on the surface. Some of the earliest names on Mars were given to light and dark markings (albedo features) by English astronomer Richard Proctor in 1867. The names he chose were astronomers involved in Mars observation, such as the Reverend William Dawes, on whose map he based his own. He was a bit over-enthusiastic, though, and re-used the same names in different features – hence the Reverend Dawes was immortalised not once but six times, as an ocean, continent, sea, strait, island and bay. 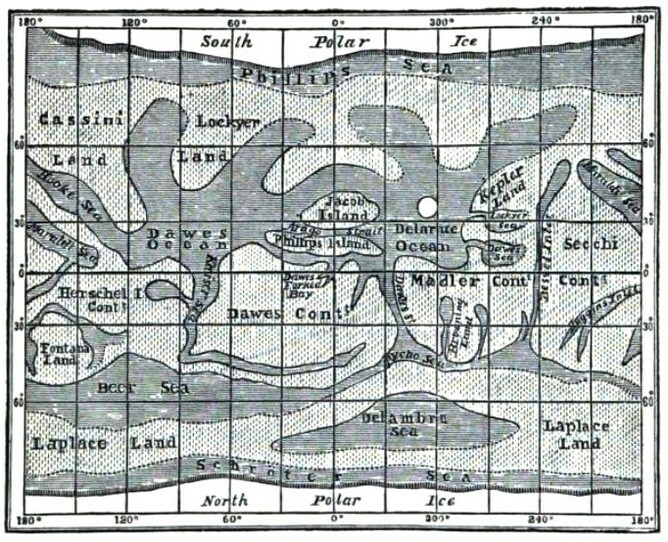 The colour-blind astronomer Giovanni Schiaparelli made a detailed Martian map when the planet was in opposition in 1877: he stuck with the classical tradition, using names such as Elysium, Tharsis and Zephyria. In 1934, Eugene Antoniadi’s map of Mercury similarly drew on classical antiquity, with an albedo feature named after the esoteric sage Hermes Trismegistus, and another after the Roman Emperor Hadrian’s solar-heated Heliocaminus baths. By the 20th century this messy and ad hoc system of naming celestial places was becoming a problem for astronomers. English astronomer Mary Adela Blagg began work on sorting out lunar nomenclature, and when the International Astronomical Union (IAU) was established in 1919, they appointed her to their first nomenclature committee. With the modern era of space exploration from the 1950s, satellites and space probes gave us new eyes to see details never before visible. The IAU had to step up its activities. In 1958 they rationalised Martian place names, in favour of Schiaparelli’s system rather than Proctor’s. Task groups were set up to handle Mercury, Venus and the Outer Planets as more deep space probes explored the solar system. The IAU has a list of preferred sources, including well-known collections of myths and legends from around the world. Scientists and the general public can also suggest names or themes. But there is no obligation for the various task groups to accept these suggestions. This year, the IAU has turned to crowd-sourcing names as a result of these two significant missions to the inner and outer solar system. To celebrate the end of Messenger’s mission, NASA and the Messenger team decided to ask the public to name five craters on Mercury. Since Mariner 10’s flyby in 1973, Mercury’s theme has been artists of all kinds: music, writing, visual arts and performance. There you’ll find the Equiano crater, after Beninese writer, abolition campaigner and former slave Olaudah Equiano; and the Sei Shonagon crater, honouring the 10th century Japanese courtier who pioneered the list as a literary form. Nominations are currently with the IAU, and the results should be announced this month. The SETI Institute and the New Horizons team have coordinated a similar campaign. They came up with an extensive list of names on Pluto’s theme – exploration and the underworld – for the public to vote on. (And yes, Cthulhu is on the ballot, along with Sun Wukong, better known to us as Monkey). They’re also accepting nominations for names not on their list. Voting closes on April 24th and the resulting shortlist will be sent to the IAU for the final decision. These naming campaigns help make the Earth-bound feel included in space exploration. But encouraging participation and diversity is far more than an exercise in public engagement. – […] not in a particular year, not in a particular place, but in the act of naming. For by the act of place-naming, space is transformed symbolically into a place, that is, a place with history. Celestial geography mirrors the power relations of terrestrial politics. The long tradition of classical and European names reflected a world-view which privileged the Western over Indigenous, Eastern and global south cultures. But through the IAU and crowd-sourcing projects such as these, the public has an opportunity to write new values onto planetary surfaces. Let’s take it!